AGP leaders calling on Union Home Minister Rajnath Singh at his residence in New Delhi on Friday evening. 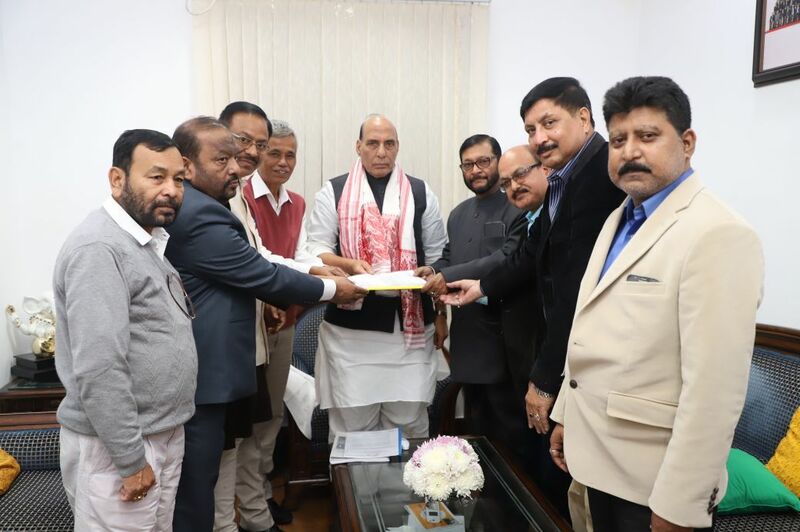 The Assam BJP and its alliance AGP came to Delhi Durbaron Fridayand called on Union Home Minister Rajnath Singh over the Citizenship (Amendment) Bill, 2016. While the State BJP leaders raised their voice in support of the Bill, AGP leaders raised their voice opposing the controversial Bill. “We have two of our colleagues in state cabinet, we are NDA’s partner but we will not compromise with the identity of the indigenous people of Assam. If necessary, we may withdraw our support from the Government,” said AGP leader Biren Baishya. “We have raised our concern that the Bill may pose a threat for the language and culture of the Assamese people,” said Dipak Das. Quoting the Home Minister Das said that he (Rajnath Singh) assured us of exploring other options before bringing the Bill into force. Baishya and seven of his party colleague called on Home Minister Rajnath Singh and lodged their protest against the controversial Bill. “Bringing out the Citizenship (Amendment) Bill, 2016 was in our election manifesto. They (AGP) knew it and after that only they came to an alliance with us and supported us…. Now if they oppose it’s their decision. They neither inform the Chief Minister nor any other senior leaders of the BJP over the issue,” said BJP leader Ranjit Das countering AGP’s stand over the Bill. As many as 18 BJP leaders including seven sitting MLAs called on Home Minister Rajnath Singh in the evening and extended their support in favour of the Bill. Supporting the contentious Bill, Nikhil Bharat Bengali Yuba Chatra Federation organized a meeting at Delhi’s Ramlila Maidanon Friday. “We came here to raise our concern over NRC and at the same time we want that the Bill come into force,” said former MP and senior BJP leader Kabindra Purkayastha. Once passed by the Parliament, Citizenship (Amendment) Bill, 2016, will make Hindu migrants from Bangladesh and other few countries as Indian citizen. The Bill contradicts the term of the Assam Accord of 1985 which said that illegal migrants who had entered Assam from Bangladesh after March 25, 1971 were to be deported. The Bill seeks to protect only non-Muslim minorities coming from Muslim countries. The Citizenship (Amendment) Bill, 2016, was introduced in the Lok Sabha in July 2016. After a hiuge hue and cry raised by several political parties, the Bill was sent to a joint parliamentary committee of both the Houses for examining and presenting a report to the Parliament.